people into assuming causality. I’m afraid you’re another victim. by the iron triangle of observations, theory, and climate models. Of course changes in trade winds can change clouds. But what causes changes in the trade winds during ENSO? It’s the changing SST distribution. Get it? Surface temps drive clouds. QED. we’ve actually reached closure. I have no more questions for you. It is clear where you are going wrong. You are confusing changes over long periods during which equilibration can occur with fluctuations from which feedbacks can be determined. Note that in order to measure feedbacks from outgoing radiation, one must look at time scales that are short compared to equilibration times (years) but long compared to the action of feedback processes (days). That fluctuations in clouds, volcanos, etc. occur over the relevant time scales is obvious as is the fact that such fluctuations must, of necessity, cause changes in surface temperature. The issue of whether clouds can cause El Nino is a red herring. Incidentally, we have looked at your data. 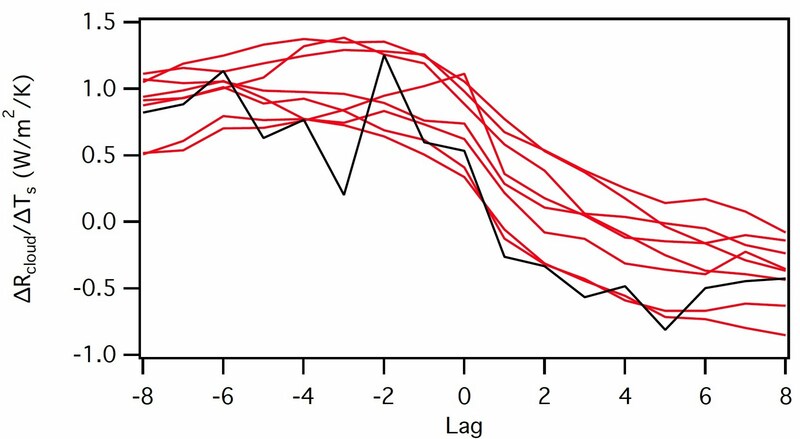 If you restrict yourself to relevant time segments, your r-square goes up greatly, and if you perform an analysis of leads and lags, you too get a negative feedback from fluctuations in outgoing radiation that lag SST (whether you choose segments or your entire record -- though again, r square is much larger for segments). 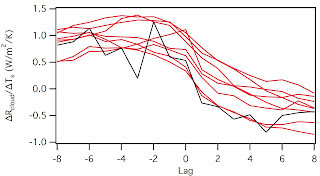 The ambiguities in the choice of segments in Lindzen-Choi 2009 disappear when one uses 2 or 3 month smoothing. I've been catching up this week after having last week off for the holidays. The evidence I presented you was NOT just the decorrelation of the data, as you claim...as I mentioned in my previous e-mail , it was TWO-fold: It is also the lagged relationship, with radiative flux changes preceding the temperature response, then the temperature changes either simultaneous with (os as we will see with ENSO, preceding) the radiative feedback response. The phase space plots we published are one way of revealing the lagged relationship. Without taking this time lag into account, you will get correlations -- and thus regression slopes-- close to zero...as you do, even in the climate model regression.....no matter what the feedbacks are. We demonstrated this in Spencer & Braswell (2010). By far the most precise measurements of global SST variations come from AMSR-E on NASA's Aqua satellite and, as you know, a CERES radiation budget instrument also flies on that satellite. I did a calculation with these data somewhat similar to the one you did. Attached find a plot somewhat analogous to yours, but from Aqua SST versus radiative flux....As you can see, the radiative feedback response occurring AFTER the temperature changes suggest strongly negative feedback. Also shown in the same plot AR4 climate model results from their 20th Century runs on the same plot. Clearly, there are cause-effect things going on here that cannot be revealed in plots like your Fig. 2, unless these time lags are taken into account. As a result of our discussion, I've decided that we should do another publication, focusing on the lag relationships seen in the Aqua data and what they might mean for feedback and climate model validation.